I have got requests from readers to write a piece on ‘Circular Seating Arrangements’ – which is why I have been toiling away re-searching to bring you all the shortcuts and tricks and tips. As in, I found things which are helpful – but you probably know them already – basic concepts & practice! So, there you have it dear friends, in puzzles and seating arrangement - nothing beats practice – there are ‘ways or methods’ to solve these sums – but ultimately there is no ‘shortcut’ trick'. Although I have shared technique to solve "Circular Sitting arrangements" here. We will discuss the ‘ways’ to solve seating arrangement sums as properly as possible! (ii) facing outward – away from the centre of the circle. ii. their ‘lefts’ is in the clockwise direction. So, when they ask who’s to the left of D, in the above diagram – close your eyes – picture yourself to be D – answer will be A. If picturing in the head is confusing – take the rough sheet you’ve drawn the diagram on and turn it around! Turn it around so that D is directly in front of you – so you become D and now according to your left/right direction – answer the questions! Nothing simpler and easier than that!! ii. their ‘lefts’ is in the anti-clockwise direction. Here too, try visualizing yourself in their places to answer – or else turn the papers around. This is the problem area for most – how to correctly seat Mr. A, B and C! Let me try breaking this ‘problem’ down to smaller problems and then we’ll tackle ‘em! 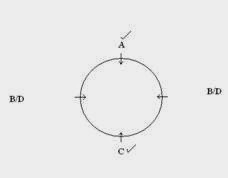 (i) Draw a circle – mark the places (4/6/7/8) – and then start reading the question! (ii) Arrange the information in every sentence – if possible – if not – write it down beside you circle in shorthand – to be arranged when further information clarifies the position. 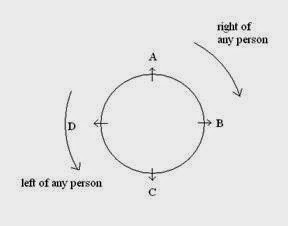 (iii) If you find a situation where, supposing, A can be seated in 2 different places – then, go ahead with one place and arrange the rest accordingly – if you successfully arrange the entire thing – then the A’s place which you had arbitrarily decided is the correct place! Okay, another one – if P has two possible ways to be seated – namely Seat 1 and Seat 2. You are not understanding from the available information, where to seat P. So you, arbitrarily seat him in either Seat 1 or Seat 2. Let’s say you seated him at Seat 2 – ok – now go ahead and try seating the others as per the rest of the information in the question. If you are able to seat ‘em all without any contradictions or problems, you have successfully solved the question and P’s seat that you chose is correct. And if you find a contradiction of P’s Seat 2 – then you immediately know for sure that Seat 2 is not the right place of P and it has to be Seat 1, as there were only 2 possibilities! (iv) Always arrange those person’s around your circle, whose positions are 100% clear and accurate. Keep the persons who you have a doubt on a little farther away so you know who’s definitely sitting correct and who you need to revise the seating for! Or, put a tick on the persons who are seated correct. This brings clarity to the fact that – these people are sitting right and these places are not available for further arrangement – the rest need to be arranged in the available places only. (v) If there are 4/6/8/10 persons, i.e., even number of people and all facing one particular direction – then 2nd/ 3rd / 4th / 5th to the left or right is always the person sitting opposite! Like in this figure, A and D are facing outward and so their arrows are pointing away from the centre; while, B and C are facing inward with their arrows pointing towards the circle. I usually more my rough sheet around without wasting my time and get the positions correct! (vii) Practice! The Golden Rule to solving Seating Arrangements – advocated everywhere by everyone is – LOTS OF PRACTICE! Honestly, there is no other way around it! Some people are just born with the knack of seating people correct and some aren’t – I fall in that category of ‘seating – arrangement – challenged’! But I make up for it by practice and perseverance! I now solve sums like I was born doing it!! Directions (Q. 1 - 5) Study the following information carefully and answer the questions given below. Bunty, Dev, Manav, Kavya, Payal, Qasturba, Wasir and Himmat are sitting around a circle facing at the centre. Manav is to the immediate right of Bunty who is 4th to the right of Kavya. Payal is 2nd to the left of Bunty and is 4th to the right of Wasir. Qasturba is 2nd to the right of Dev who is 2nd to the right of Himmat. Q1. Who is 3rd to the right of Bunty? Q2. Which of the following represents the immediate neighbours of D? Q3. Who is 3rd to the right of Wasir? Q4. Who is 2nd to the left of Payal? Q5. Who is to the immediate left of Bunty? Directions (Q. 6 - 10) Study the following information carefully to answer these questions. Amrit, Bector, Chinky, Deepinder, Eeshwar, Fancy, Gurkamal and Hero are sitting around a circle facing the centre. Fancy is third to the right of Chinky and second to the left of Hero. Deepinder is not an immediate neighbor of Chinky or Hero. Eeshwar is to the immediate right of Amrit, who is second to the right of Gurkamal. Q6. Who is second to the left of Chinky? Q7. Who is to the immediate right of Chinky? Q8. Which of the following pairs of persons has first person sitting to the right of the second person? Q9. Who sits between Gurkamal and Deepinder? Q10. Which of the following is the correct position of Bector with respect to Hero? Directions (Q. 11-15) Study the following information carefully and answer the questions given below. Akshay, Manisha, Deepak, Paresh, Ranbir, Tarun, Bector and Hrithik are sitting around a circle facing at the centre. Manisha is 3rd to the left of Akshay who is 2nd to the left of Tarun. Deepak is 2nd to the right of Hrithik who is 2nd to the right of Tarun. Ranbir is 2nd to the right of Bector who is not an immediate neighbour of Tarun. Q11. 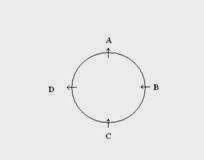 Which of the following combinations represents the first and the second to the left of Bector respectively? Q12. Who is 3rd to the right of Tarun? Q13. Who is to the immediate left of Hrithik? Q14. Who is 2nd to the left of Bector? Q15. 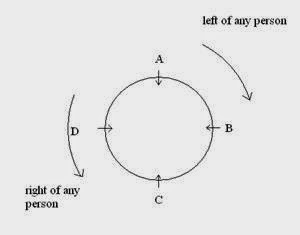 In which of the following combinations 3rd person is 2nd to the left of 2nd person? i've scored 86 marks in office assistant 1 ,...,Is the score good n what are my chances of selection...??? ur all articles r really very knowledgeable + quite easy 2 understand thus interesting.sir plz post tricks to solve input problems n assumptions.